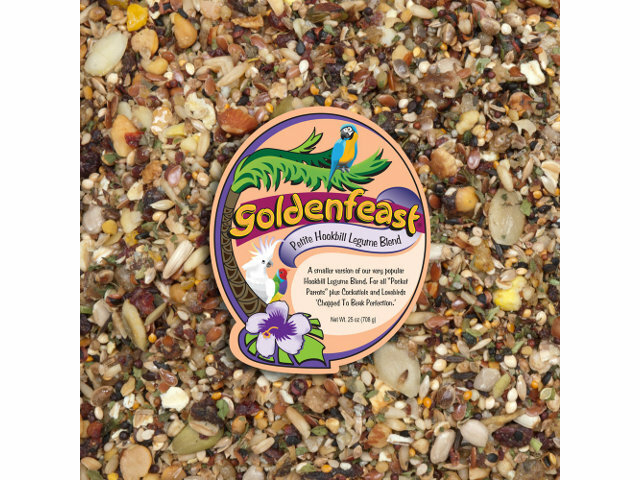 Goldenfeast Petite Hookbill Formula bird food is a smaller version of their very popular Hookbill Legume for smaller or pocket hookbills plus cockatiels with over 40 ingredients. Contains assorted fruit granules, cooked dehydrated black bean granules, hemp seed and more. Canary grass seed, roasted unsalted almonds, steel-cut whole organic oats, sunflower kernels, flax seed, white pros millet, cantaloupe seed, natural seseme seed, black sesame seed, roasted soybeans, sterile hemp seed, roasted unsalted cashews, organic cranberries, organic blueberries, japanese millet, freeze dried honey, freeze dried molasses flakes, pineapple, natural mango, red siberian millet, raspberry seeds, green cabbage, granola (made with rolled oats, rolled wheat, brown sugar, canola oil, natural coconut, sweet dairy whey, out flour, almonds & honey), fine cracked corn, wildflower seeds, canola seed, caraway seed, carrots, freeze dried corn, cherries, dehydrated cooked beans, parsley, turkish dates, papaya, basil, pecans, wheat germ, cranberry seeds, orange peel granules, bentonite crumbles, natural flavors of orange, lemon & blackberry extracts.